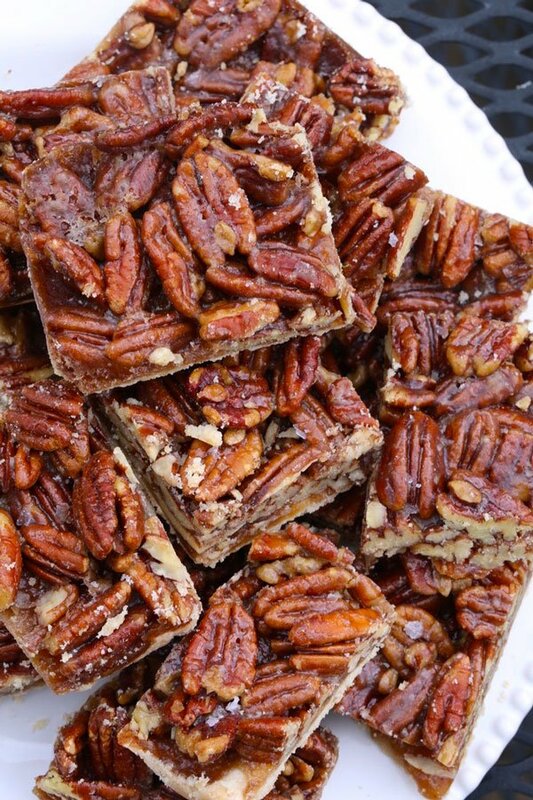 Pecan Bars recipe with shortbread on the bottom and lots of pecans on top. 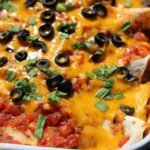 This is a quick and easy recipe to whip up in under 30 minutes. 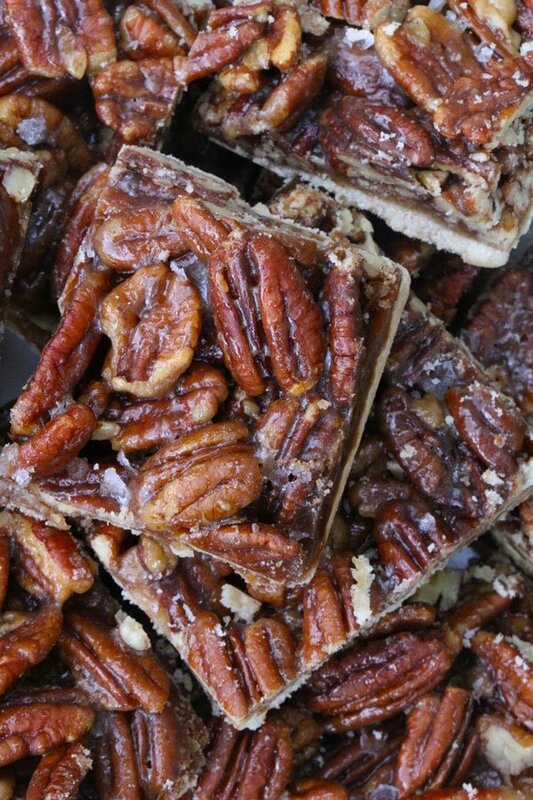 There is a cafe near our house that always has the most delicious pecan bars for sale in a basket on their counter at checkout. I can never resist grabbing one of the bars, as an impulse buy to go with my sandwich. The shortbread base with fresh pecan halves on top, drenched in a brown sugar sauce, is always such a delicious treat. 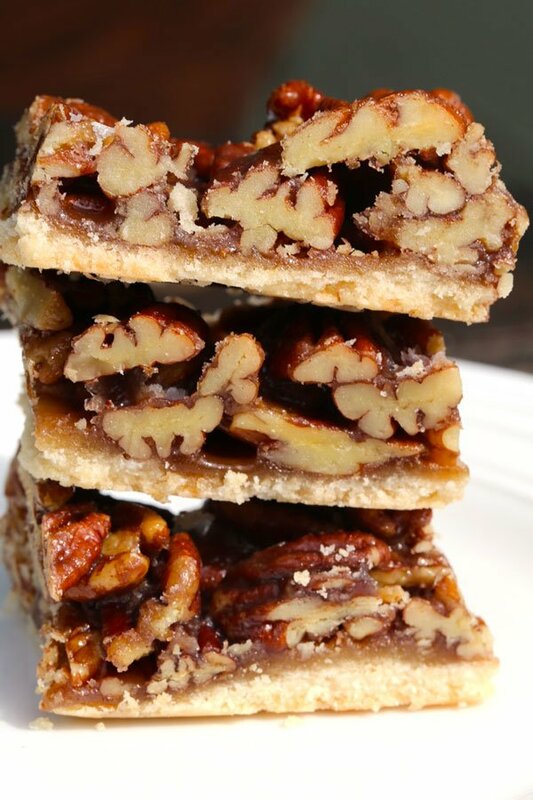 I’ve been wanting to learn how to make these pecan bars with shortbread crust for awhile. Now, I know, and its pretty darn easy. This particular recipe focuses on maximizing the pecans to sauce ratio. And, this is a good thing. SO good. Toast the pecan halves on a parchment paper lined baking sheet for 8-10 minutes in a preheated 350 degree oven. 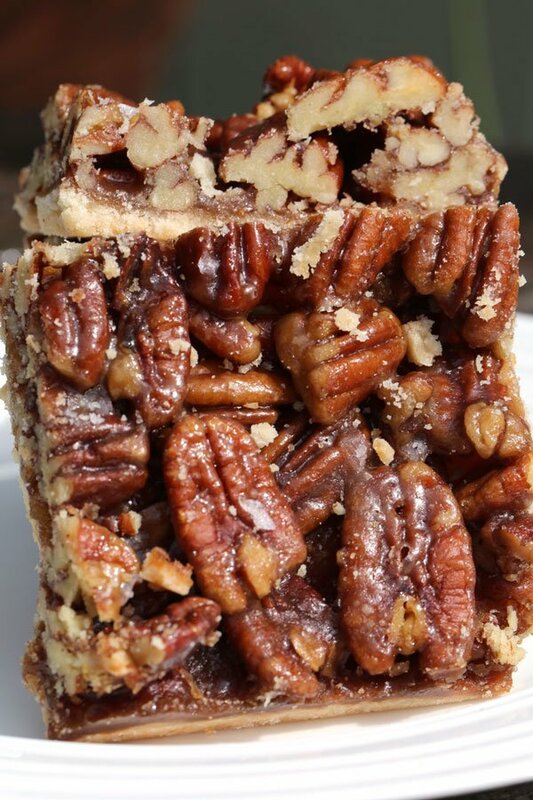 Toasty pecans add so much more flavor to these bars. 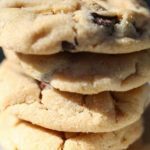 I added a 1/2 teaspoon of flake sea salt to the top of the bars when they first were removed from the oven, for a salty/sweet pop of flavor. 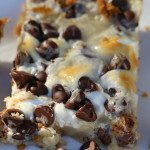 Are these pecan bars with Karo syrup? Yes, this recipe calls for light corn syrup. I used the Karo brand. How to tell when pecan bars are done? Look in your oven close to the end of the cooking time. If the brown sugar mixture/sauce is bubbling, that means the bars are done. You’ll see a nice glaze over the pecan halves and the rest of the sauce settling on top of the shortbread crust. 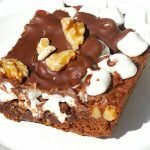 How to cut pecan bars? After they have cooled for 1 1/2 hours, its time to cut the bars. You will want to use a long serrated knife. Make sure to cut them at this time, rather than waiting. The bars will harden a bit in the next few hours, after the initial cooling, and it becomes a little more difficult to cut the squares. 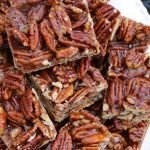 How to store pecan bars? I wanted to share the side view of these beauties in the photo above, so you can see the pecan to shortbread ratio first hand. Pretty delicious looking, don’t you think? These pecan bars are so much easier than I was anticipating. 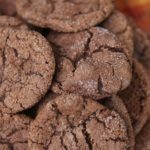 Isn’t it such a treat when that happens in our baking adventures? I think so. 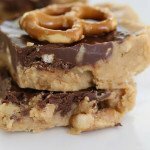 SAVE THESE PECAN BARS TO YOUR “DESSERTS” PINTEREST BOARD! And, let’s be friends on Pinterest! 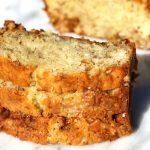 I’m pinning delicious recipes all the time. Move oven rack to lowest position in your oven, and preheat to 350 degrees. Tear two aluminum foil sheets off of your roll (one about 13 ins, and the other 9 ins). Lay the longer sheet in the baking pan, pushing foil into corners. Then lay second piece perpendicular to the first piece. Lightly spray the foil with cooking spray. You've just created a foil sling. This will help with removal of bars from pan after cooking. Whisk flour, sugar and salt together in medium bowl. Add melted butter, and stir with wooden spoon, until a dough begins to form. 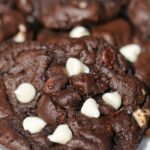 With your hands, mix the dough together, until the flour is completely incorporated, and when you squeeze a handful of dough, it stays together a bit. Spread tablespoon size bits of dough all over pan and push down with your fingers and palm of your hand, until the bottom of pan is evenly covered with the crust. In a medium bowl, whisk sugar, corn syrup, melted butter, vanilla, and salt together, until smooth (about 30 seconds). With a spatula, fold pecan halves into sugar mixture, until evenly coated. Pour topping over crust, using a spatula to spread evenly over crust. Bake in preheated oven for 23-25 minutes, or until topping is evenly spread and bubbling rapidly. Transfer pan to wire rack. Cool bars in the pan for 1 1/2 hours. Pull bars out of pan using foil sling. If you want to add the optional flake sea salt, this is the time to do it. Cut into squares on a cutting board. Serve and Enjoy!!! Store in Airtight container.